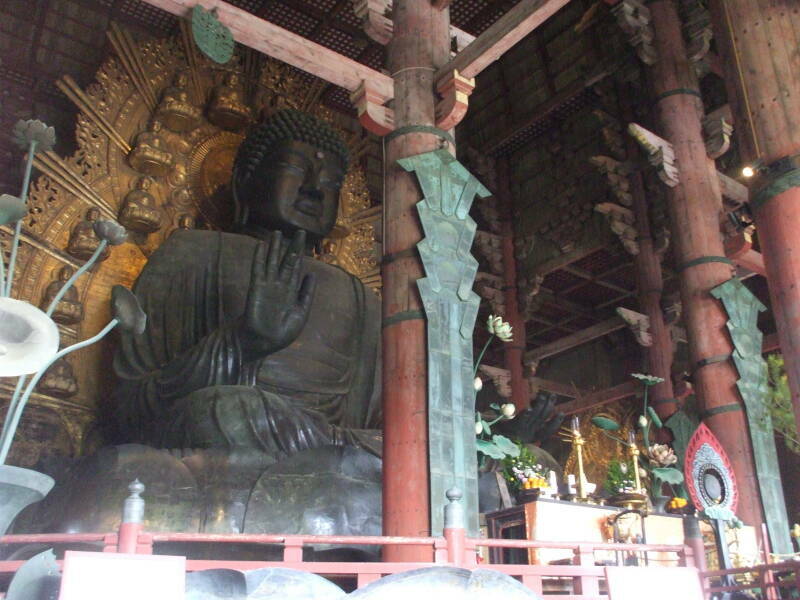 Buddhism is practiced in temples. Buddhist temple names end -ji or -tera or -dera. 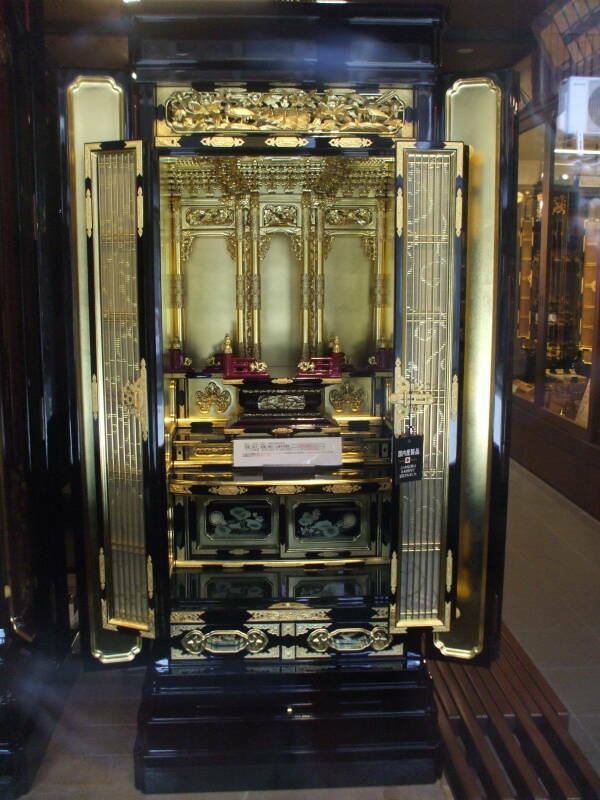 Elaborate entry gates or San-mon function much like the torii at Shintō shrines. They mark the boundary as you pass into sacred space. 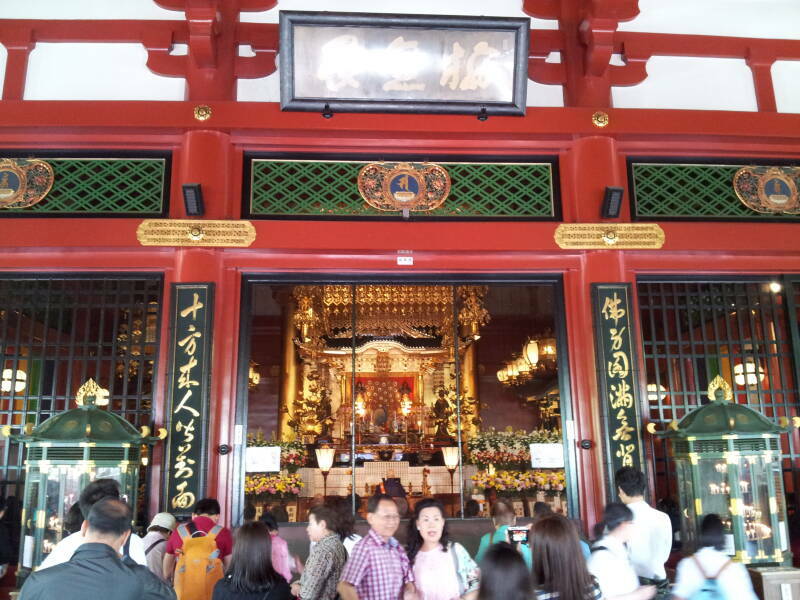 The gates can be as large as the hon-dō, the main hall where you typically find one or more images of the Buddha. 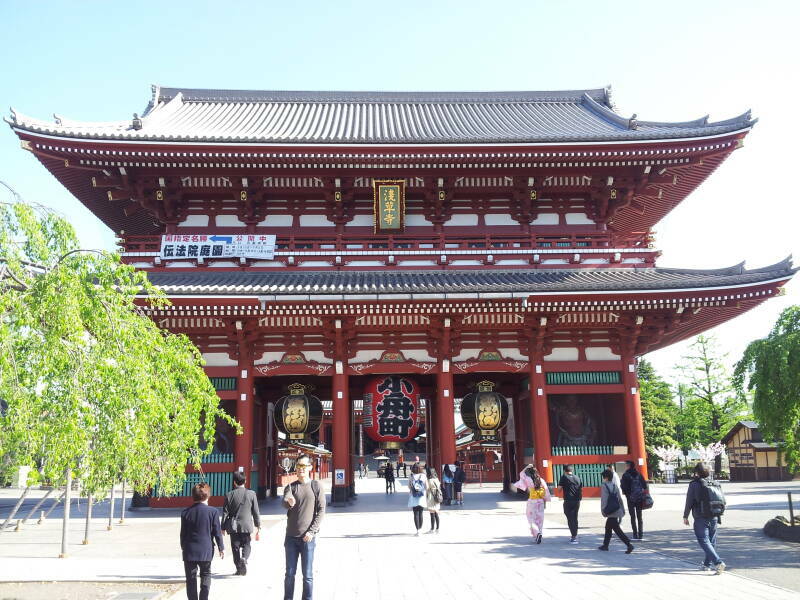 Here is Kaminari-mon, the outermost gate as you enter the Sensō-ji temple complex in the Asakusa district of Tōkyō. 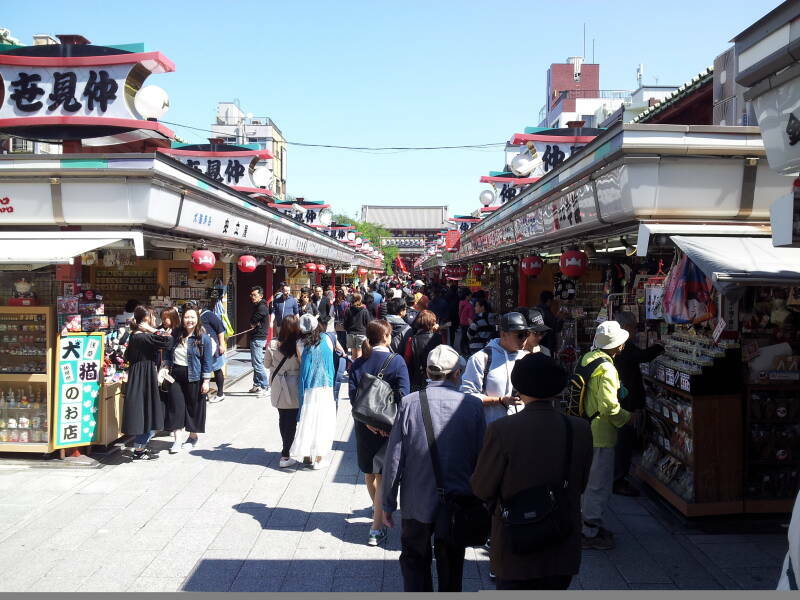 You pass through several blocks of vendors' shops along Nakamise-dōri before you reach the great gate Hōzō-mon. Large lanterns hang in the gate's archways, with the statues of guardians flanking the passageways. The guardians are Niō figures, also known as Shukongō-shin. They are derived from Hindu deities, with fierce appearances that repel evil spirits, demons, and thieves from the temple grounds. 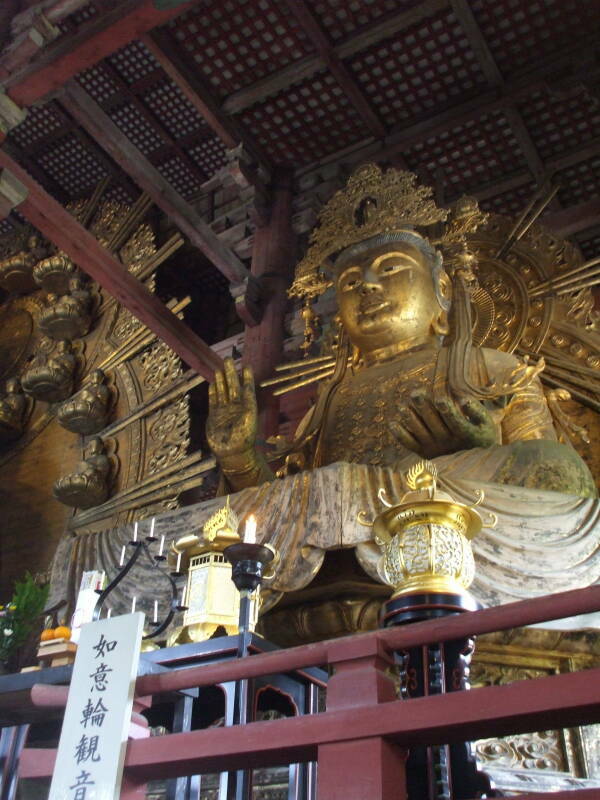 Agyō is at your the left as you enter, wielding a vajra or thunderbolt. Ungyō stands on the right, empty-handed or wielding a sword. Their appearance is derived from the Greek hero Ήρακλῆς, or Herakles. Greco-Buddhist art used traditional imagery of Herakles to represent Vajrapāṇi, the protector of the Buddha. Alexander the Great and his army transported Greek culture to the edge of the Indian subcontinent. From there it dispersed even further, traveling through Central Asia and China along the Silk Road, and then continuing to Japan along with Buddhism. A five-level pagoda stands off to one side of the gate. A pagoda is another form of a Buddhist temple. Its shape is derived from a stupa, a Buddhist tomb or monument. A pagoda might simply be a temple in an alternative form. Or, like a stupa, it might be a tomb or monument, holding relics. They typically have an odd number of levels. 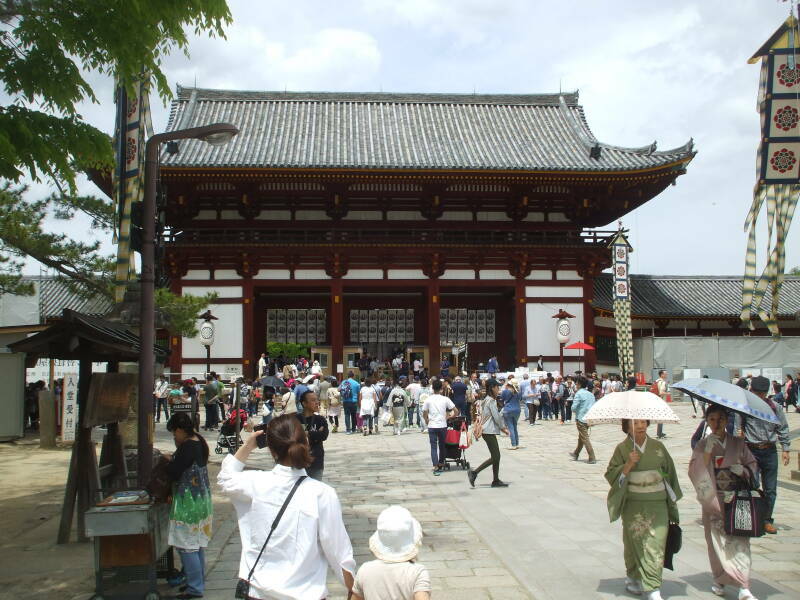 As you step through Hōzō-mon, the large gate, the hon-dō or main temple hall is visible beyond vendors selling ema or votive plaques, charms, amulets, and more. 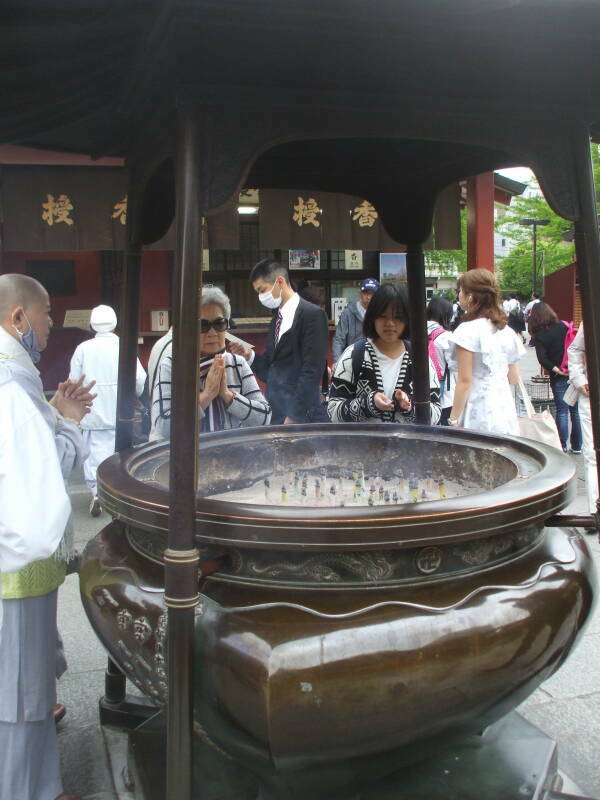 A large incense burner is close to the temple. You stand close to it and wave the cleansing smoke, "the breath of the gods", over yourself. Then stop at the sheltered hand-washing basin. 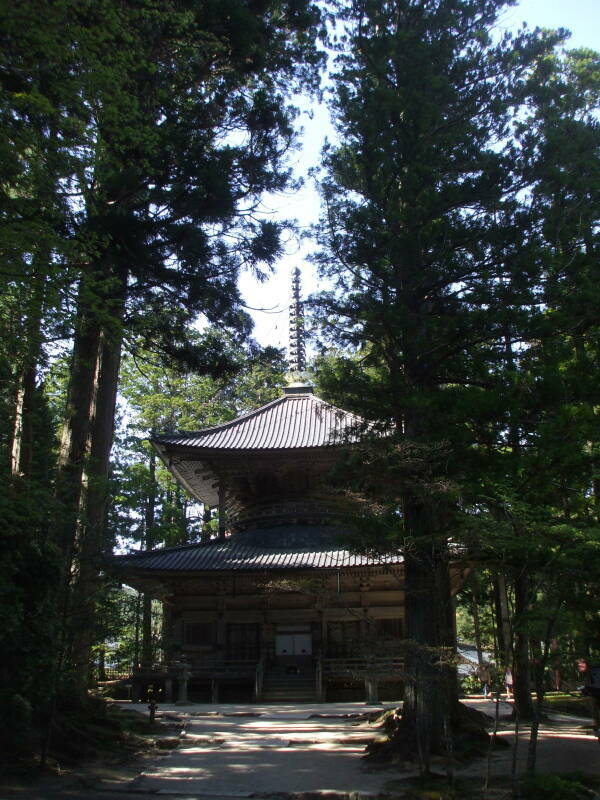 The shelter or pavilion might be called a chozu-yakata. 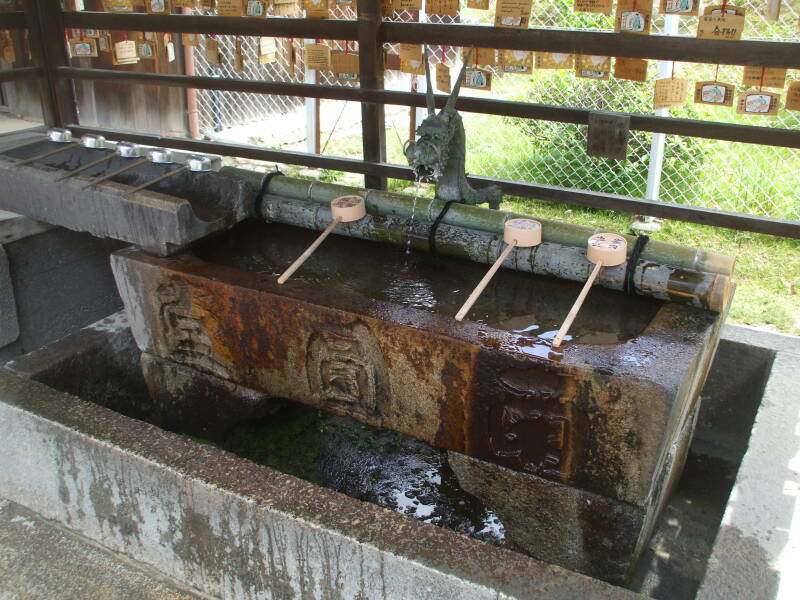 The basin itself is the tsukubai, a word based on the verb tsukubau meaning "to bow down", to humble yourself. 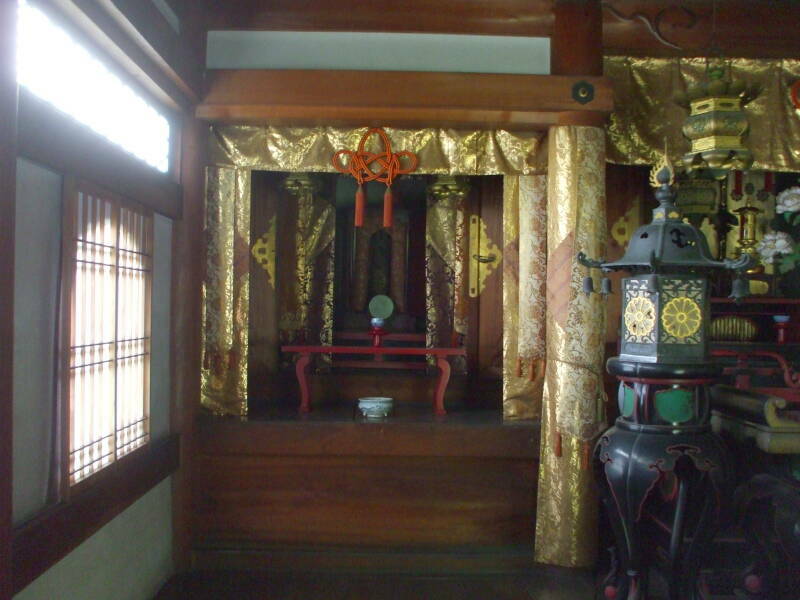 Shintō has different specific names for the purification rite (temizu), the water reservoir (chōzubachi), and the shelter (chōzuya or temizuya). Now you are clean, ready to go into the hon-dō, the main hall of the temple. You very likely will need to remove your shoes before stepping onto a wooden surface. 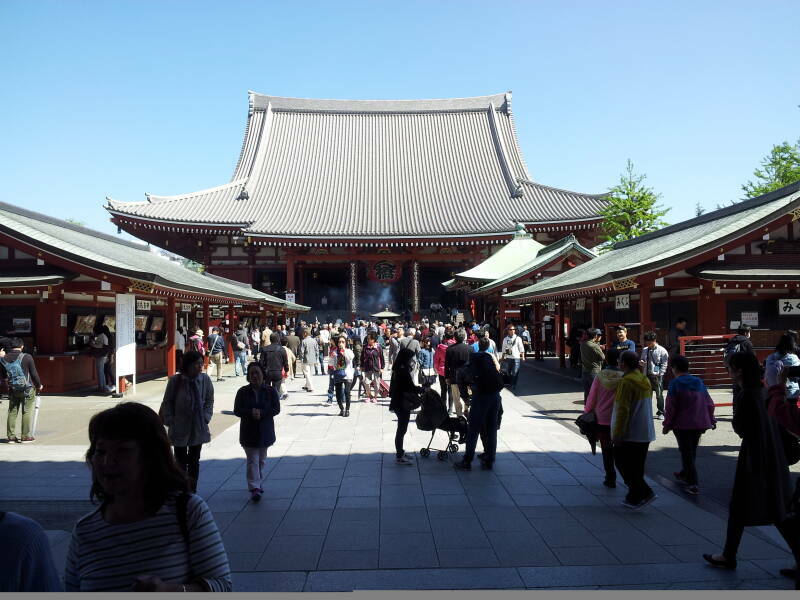 That's not the case here, as Sensō-ji is unusually busy. They say there are over 30 million visitors annually, making it the most visited spiritual site in the world. When I first arrived there in mid-April the temple was peaceful, especially when jet lag had me up wandering around very early. The 0630 sutra chant was very nice. At the end of that trip in mid-May the vacation season had started and it was hectic and noisy, filled with tourists ignoring the "No Photography" signs. The Nara Period of 710-794 AD was when the Imperial court stopped moving to a new location after the death and burial of each Emperor. The Emperors up to that period were buried in kofun, megalithic passage graves covered with an earthen tumulus and usually surrounded by a keyhole-shaped moat. Megalithic passage graves in Britain date from approximately 3500 to 2000 BCE. The megalithic age came much later in Japan, from the early 3rd century CE until the early 7th century. The Kojiki and Nihon Shoki were written in 711-712 and about 720 CE. 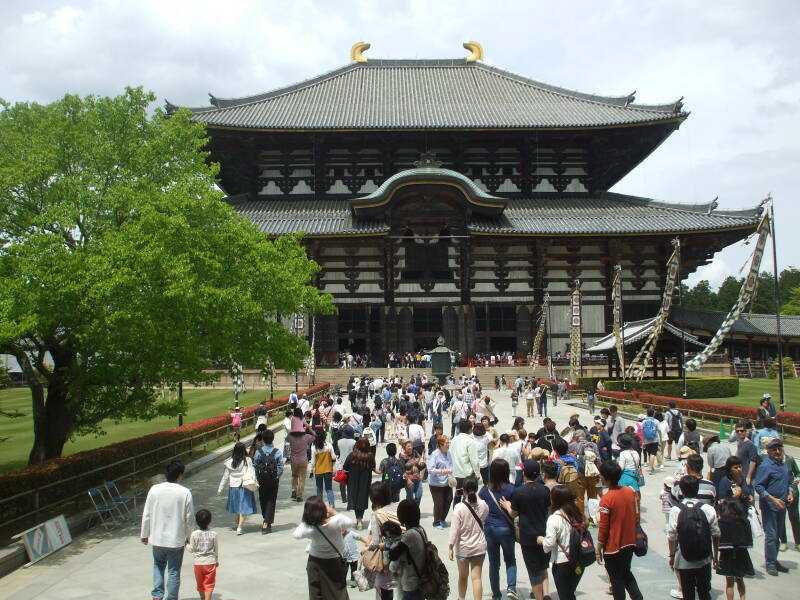 The Emperor Shōmu established Kinshōsen-ji, the first of a series of temples at Nara, in 728. There was a period of epidemics, disasters, and crop failures. Emperor Shōmu was forced to move his capital 4 times. He called for provincial temples to be built throughout Japan. 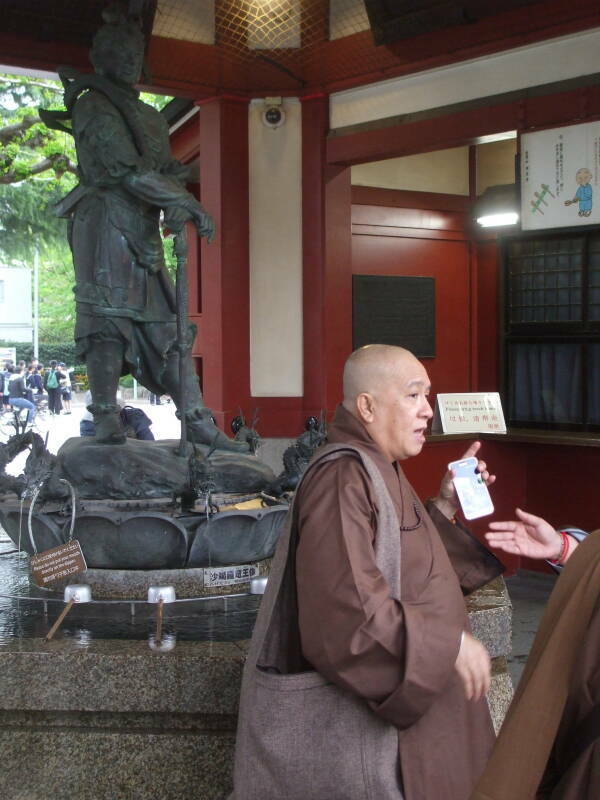 The legend is that the monk Gyoki went to the Ise Grand Shrine along the southern coast, with the goal of reconciling Buddhism with Shintō. After seven days and nights reciting sutras, the oracle at that shrine declared that Vairochana, a celestial Buddha interpreted as the Dharma Body of the historical Buddha, was compatible with the worship of the sun goddess Amaterasu. 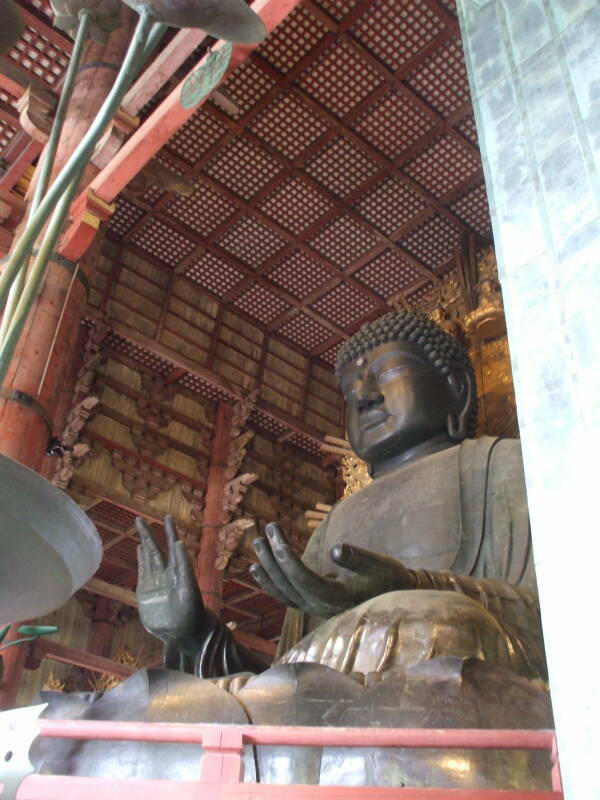 Emperor Shōmu commissioned a Daibutsu, an enormous bronze statue of the Buddha. 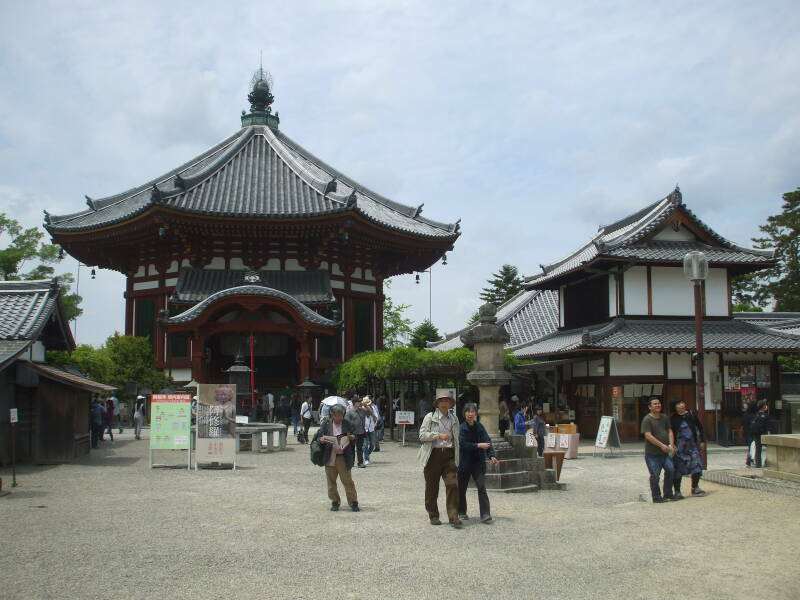 It was constructed at the Tōdai-ji temple and dedicated in 752. 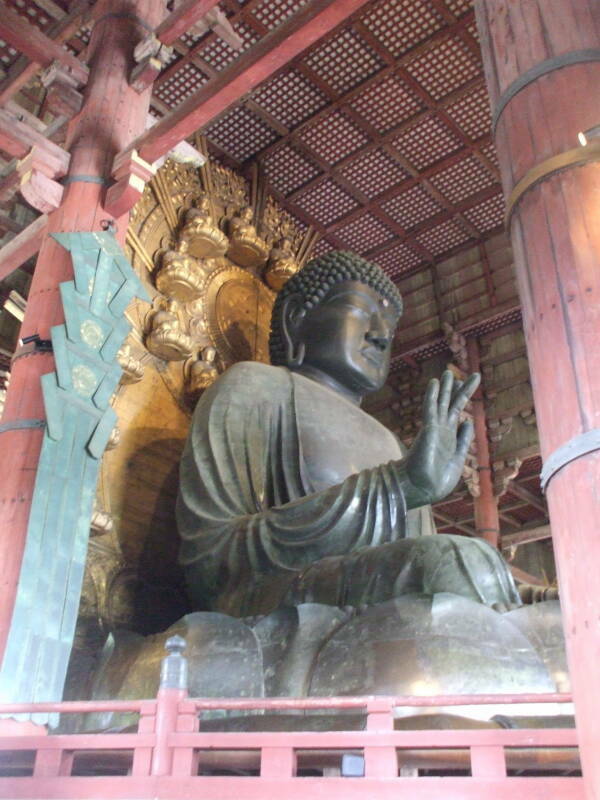 The statue was over 16 meters tall and weighed over 400 tonnes, making it the largest bronze Buddha statue in the world. The main hall, the Daibutsuden, was enormous. It has been destroyed by fire and rebuilt multiple times. The current structure was built in 1709 and until 1998 it was the world's largest wooden building. The previous version had been 30% larger. 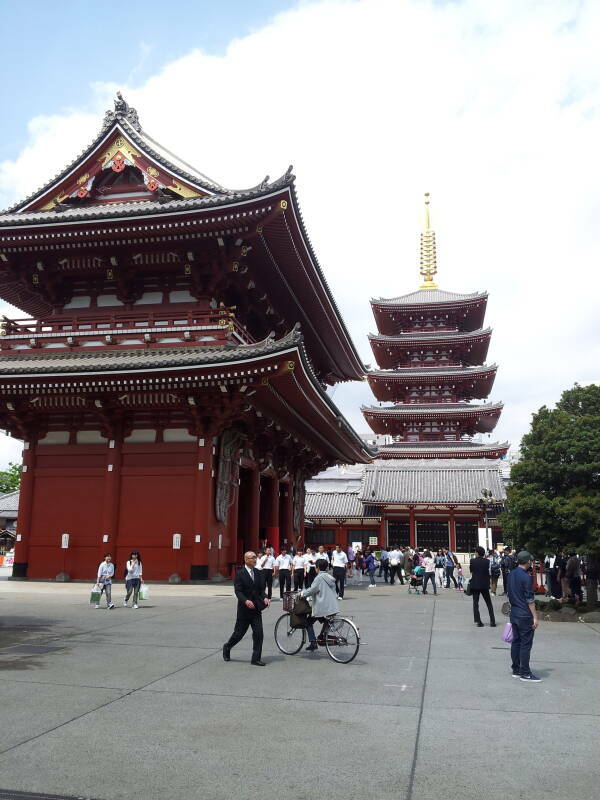 Below we see Nandaimon, the Great South Gate, and then the Daibutsuden of Tōdai-ji. Buddhism had originated in India and spread through Central Asia, China, and Korea before reaching Japan, but the statue faithfully presented the classic Indian gesture iconography. The right hand is in the "fear not" gesture, and the left in "bestowing boons". 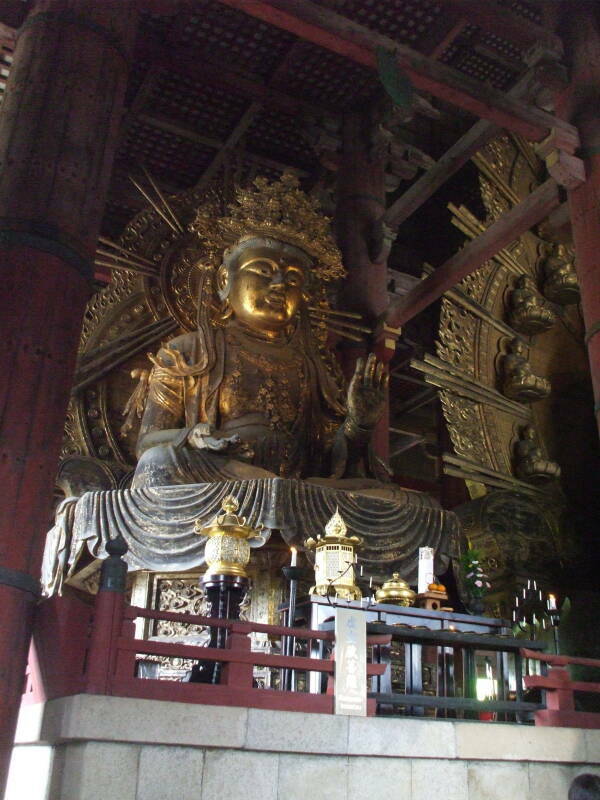 The Buddha represented here isn't the historical Prince Gautama Shakyuamuni, but the "Great Sun Buddha", Vairochana in Sanskrit or Dainichi-nyorai in Japanese, one of five Guardian Buddhas of the Planes of Meditation. The Buddha is flanked by two Bodhisattvas, enlightened beings. They also display the "fear not" and "bestowing boons" gestures. 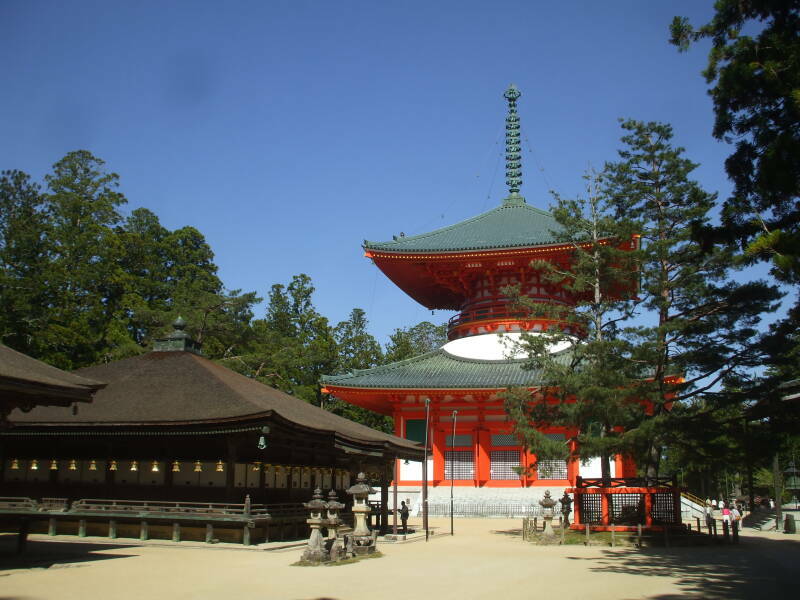 The Kofuku-ji temple complex is closer to the center of Nara. 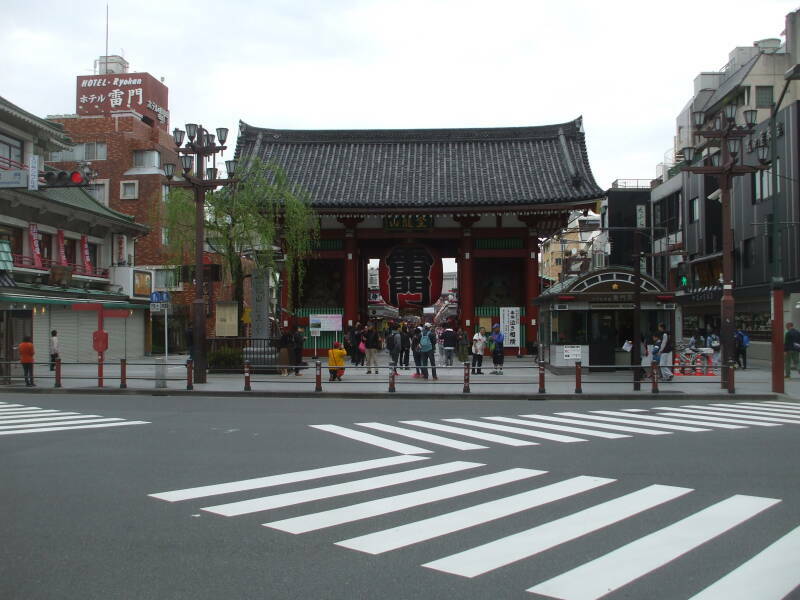 The temple was established in 669 CE in present-day Kyōto. It was dismantled and moved twice, arriving at Heijō-kyō, today's Nara, in 710. Civil wars and fires have destroyed the temple complex several times, and it has been rebuilt repeatedly. Some of the halls are missing today. The largest was being reconstructed when I was there. These are relatively small structures of the complex. 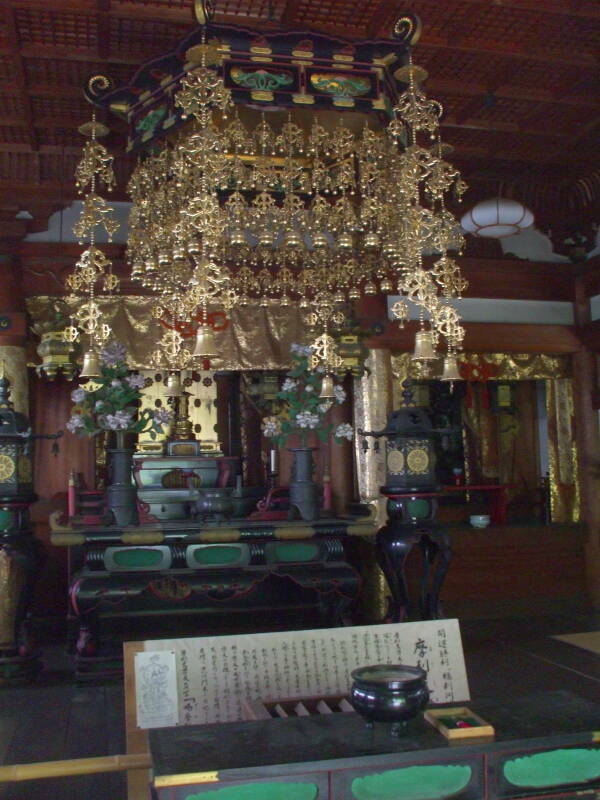 The structure seen below is a Shintō shrine. 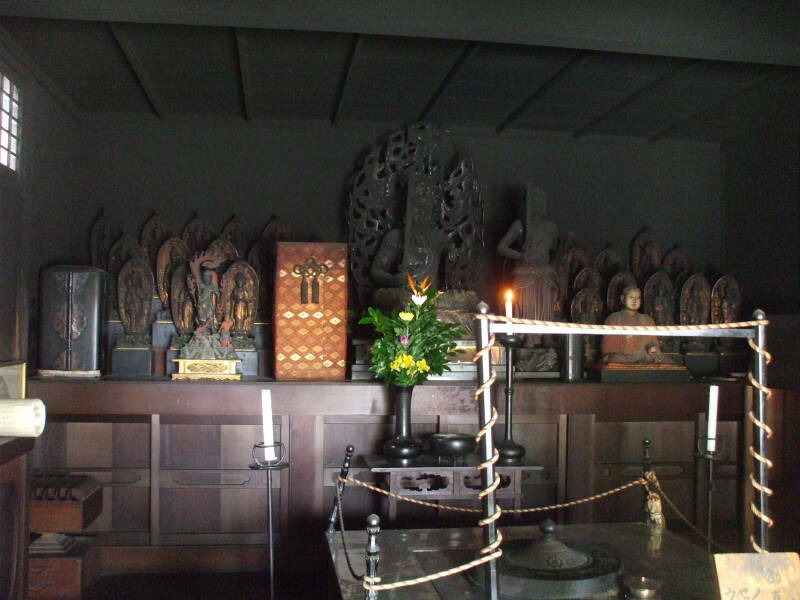 There are no representations of the Buddha, Bodhisattvas, or other Buddhist figures in the sanctuary. There is, however a mirror. A mirror frequently serves as a representation of the unseen kami. 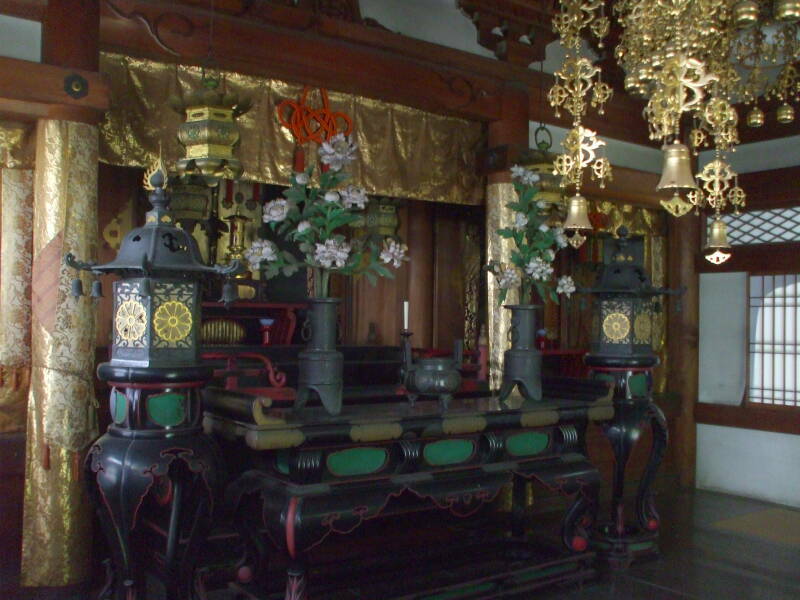 The one seen below, however, definitely is a Buddhist temple! Choshoin-ji is a small temple just outside the large Nanzen-ji complex in Kyōto. 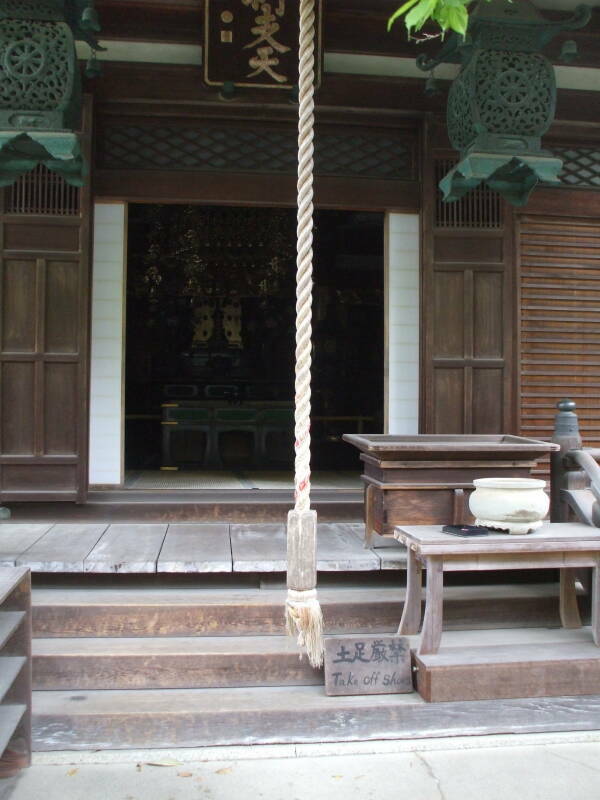 It is a Buddhist temple, although it has some Shintō features like the rope and bell. 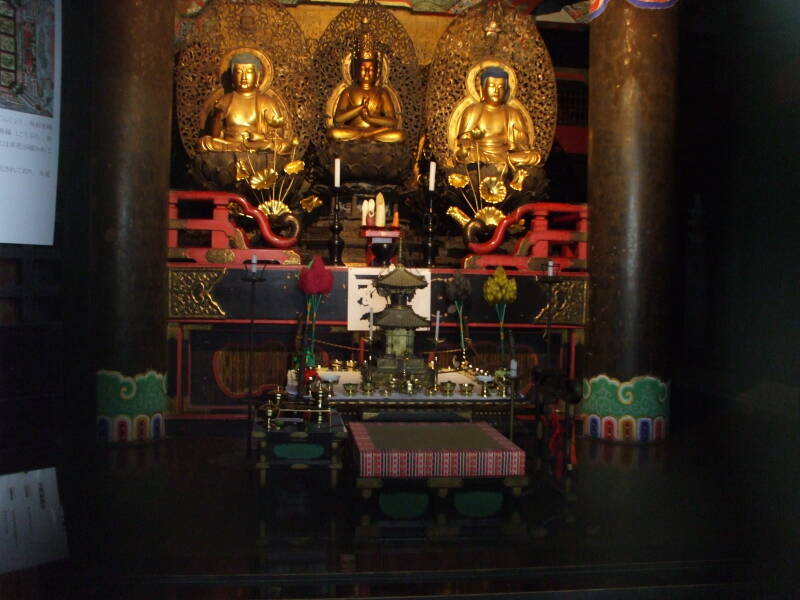 There are Buddha figures beyond the altar at the center and to either side at the front of the sanctuary. although they are dark and hard to see here. 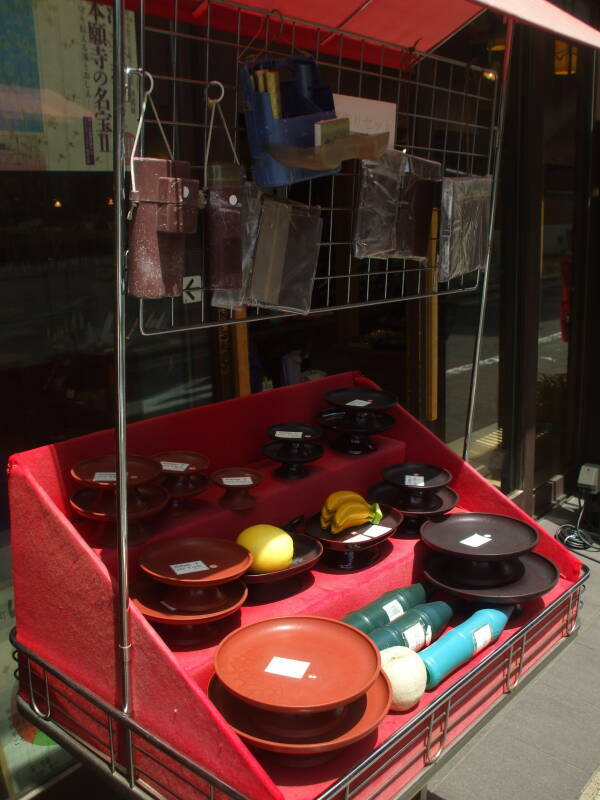 Notice the ringing bowls of different size and pitch, and strikers you can use. The floor is covered in tatami mats, as usual. 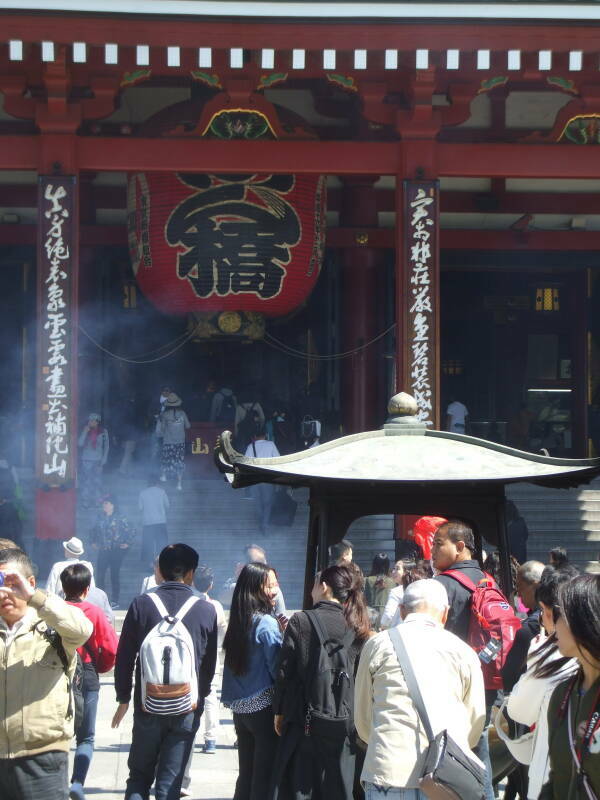 Regardless of whether one is Buddhist or not, everyone is welcomed to burn incense. 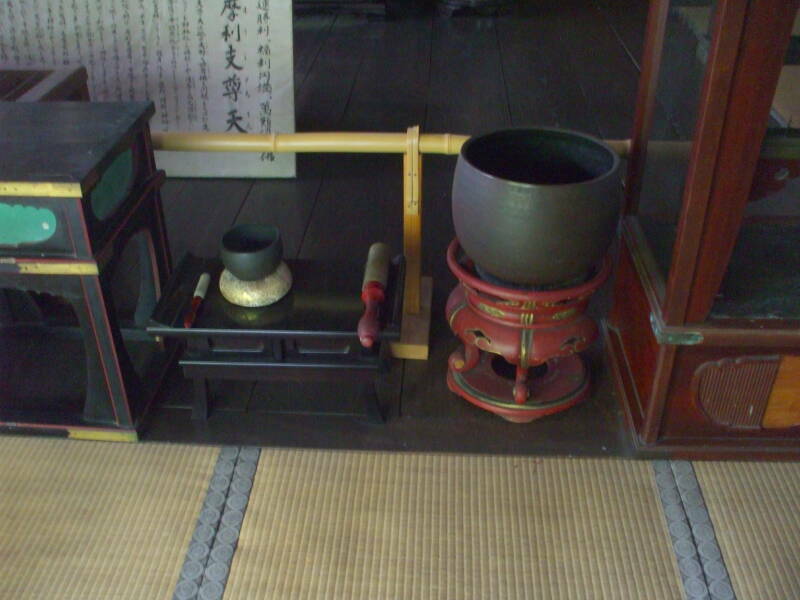 The following steps describe the correct way of burning incense. Approximately two steps from the incense burner, stop with your feet together (side by side). From the standing posture, bow. Return to an upright standing posture. From the standing posture, take a step (or two) forward beginning with your left foot. You should be close enough to the incense burner to easily place ground incense inside the burner. Take a pinch of incense from the incense caddy that is placed just before the incense burner with your right hand and drop or sprinkle (please do not throw) the ground incense inside the burner. Place the palms of both your hands together and place your joined hands chest high. If possible, your hands should be at a 45 degree angle. This gesture is known as Gassho (literally, "palms joined"). Finish the bow by returning to an upright position (with your hands still doing Gassho). Lower your hands and place them by your sides. Take a step (or two) back beginning with your right foot. Kōya-san or Mount Kōya is a mountaintop complex of monasteries. 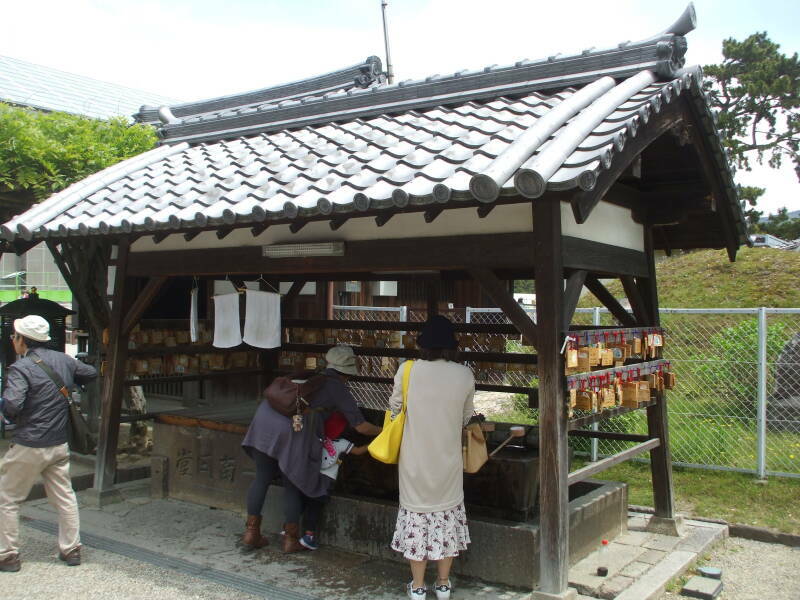 It was established in 819 by the monk Kūkai. 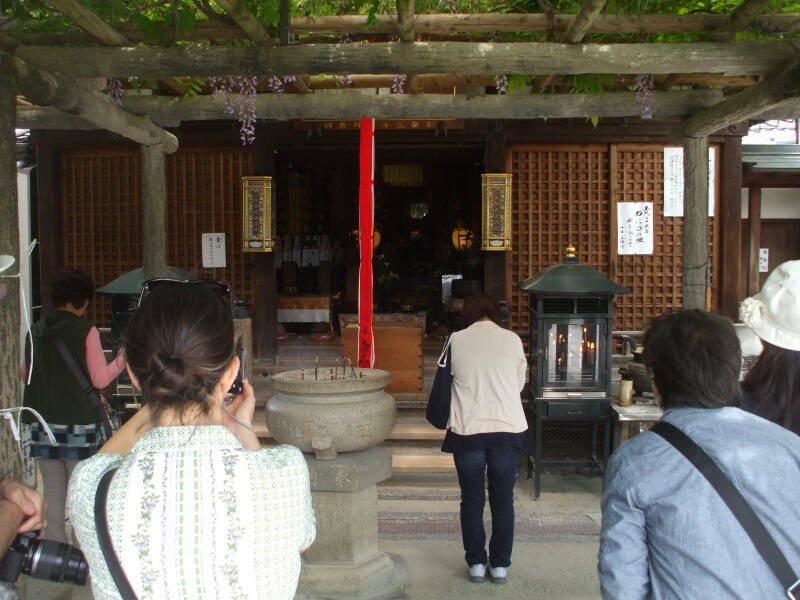 It is the headquarters of the Kōyasan Shingon or "True Word" sect of Japanese Buddhism. 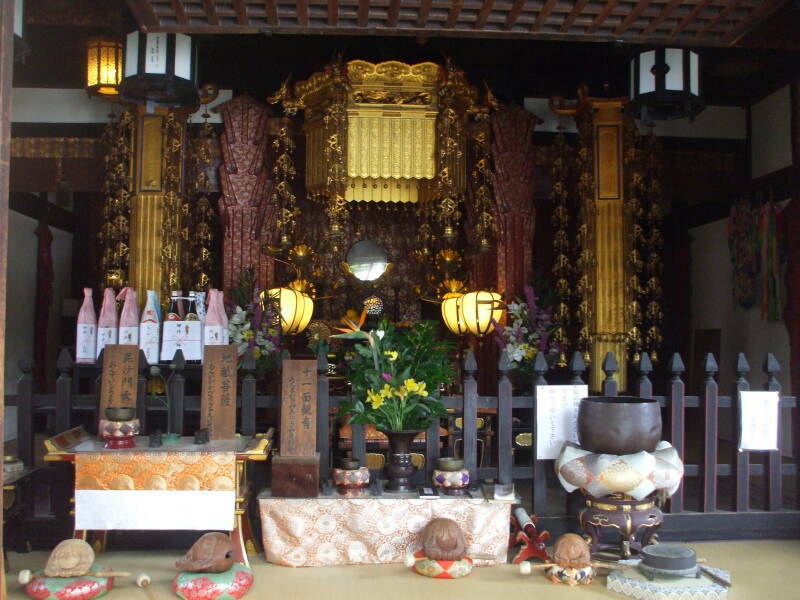 Shingon is one of the major schools of Buddhism in Japan, and one of the few surviving Vajrayana Buddhist lineages surviving in East Asia. Shingon is the Japanese pronunciation of the Chinese Zhēnyán or "True Words", which in turn is the Chinese translation of the Sanskrit term mantra. A mantra is a sacred utterance, a numinous sound believed to have psychological and spiritual powers. Meditation while chanting a mantra can induce an altered state of consciousness. Kūkai's uncle had taught him to read Chinese classics. Kūkai studied at Nara, the capital at the time, for what would probably be a bureaucratic position applying the Confucian material of the government training. He became disillusioned with that, and became an independent Buddhist monk, a position outside the law at that time. Somehow he got himself onto a government expedition to China to learn more about the Mahāvairocana Tantra, a document in which he had been deeply interested for some time. He traveled to Chang-an, now the city of Xi'an, and met the Master Huiguo, who initiated Kūkai into the esoteric Buddhist tradition. Kūkai had expected this to take 20 years, but he memorized the doctrine rapidly and was pronounced a master within a few months. Master Huiguo died soon afterward. He had foreseen that Esoteric Buddhism would not survive in India and China. Sure enough, 30 years later Emperor Wuzong of Tang assumed the throne of China. He saw Daoism as the ethnic religion of the Han Chinese, and considered Buddhism, with its origins in India, to be an alien religion, with its monasteries and temples nothing more than useless tax evaders. In 845 he destroyed 40,000 Buddhist temples and 4,500 monasteries, forcing about a quarter of a million Buddhist monks and nuns out of the monasteries. Wuzong was soon assassinated, but Chinese Buddhism and especially its Esoteric practices never recovered. Kūkai returned to Japan in 806 as the 8th Patriarch of Esoteric Buddhism, and carrying a collection of texts that were new to Japan. Kūkai is called Kōbō-daishi or the Great Master of the Propagation of Dharma, or Odaishi-sama, the Great Master. The Japanese Emperor Saga supported Kŭkai's request to establish a new monastery in 816. The monastery complex is in a mountaintop valley at about 800 meters elevation. The high valley is surrounded by eight peaks, supposedly resembling a lotus blossom. There are 120 temples and a university for Buddhist priests. Many of the temples and monasteries offer lodging to pilgrims. 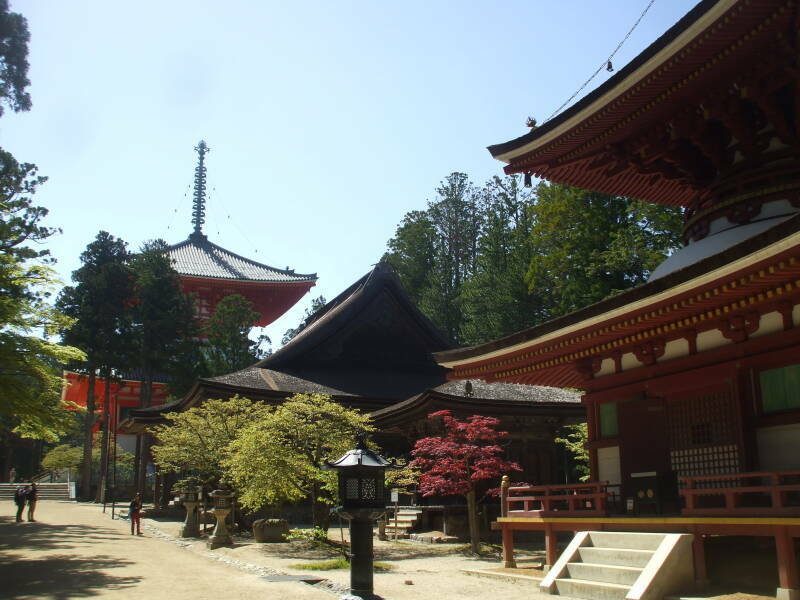 The Garan or Danjogaran temple complex shown below is at the heart of Kōya-san. 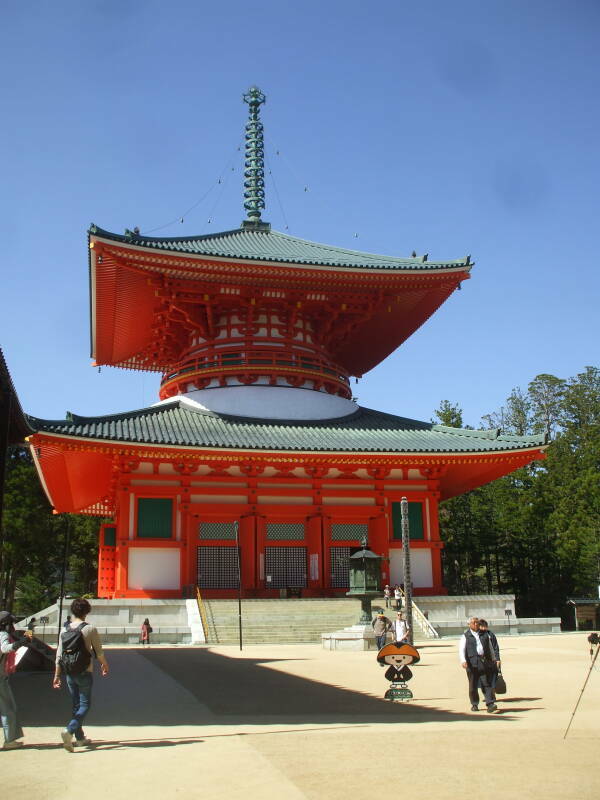 The Konpon Daitō is a pagoda that, according to the Shingon doctrine, embodies an mandala encompassing all of Japan. Basically, a three-dimensional model of the universe located at its very center. 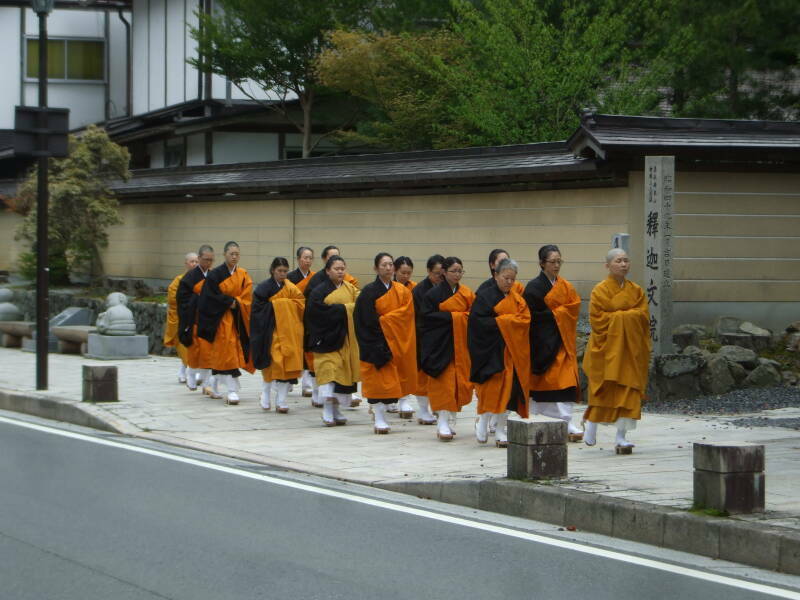 Jukai is a formal and ancient Buddhist ceremony for receiving the Buddhist lay precepts. The Ten Wholesome Precepts or the Ten Guides to Wholesome Conduct are called Jūzen-kai in Japanese. There are three precepts of body, four precepts of speech, and three precepts of mind. 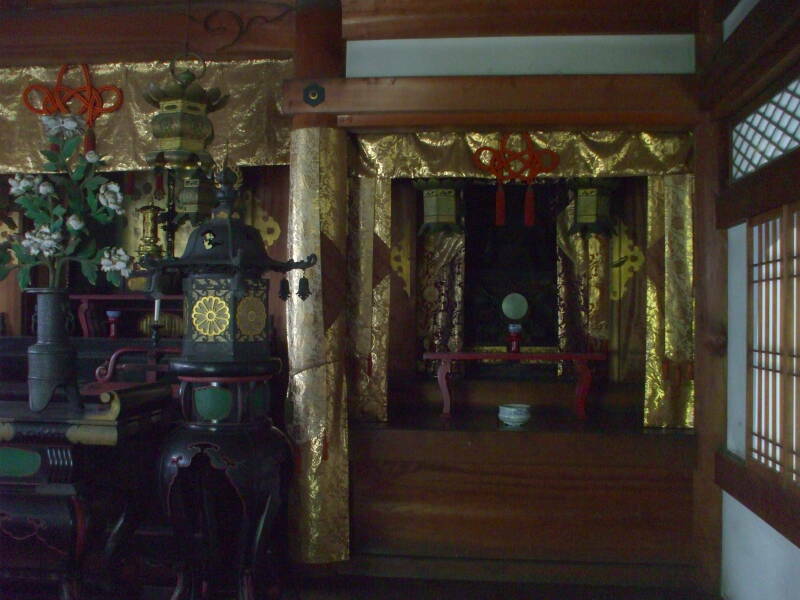 You can attend a Jukai ceremony at Kōya-san, at Kōyasan Daishi Kyōkai. Kūkai's mausoleum is in the large nearby cemetery. The Shingon doctrine is that Kūkai isn't really dead, he entered an "eternal samadhi", an indefinite death-like meditative state. He was entombed rather than the traditional cremation. There is a belief that only Kūkai will be able to interpret the Maitreya's message. Maitreya is a figure from Buddhist eschatology. Maitreya is the Buddha of the Future, a Bodhisattva who will appear some day, achieving complete enlightenment and teaching the pure dharma. The Maitreya will appear, Kūkai will awaken, and everyone wants to be close. So, the cemetery is enormously popular. Members of that sect want to have at least a lock of their hair entombed there. 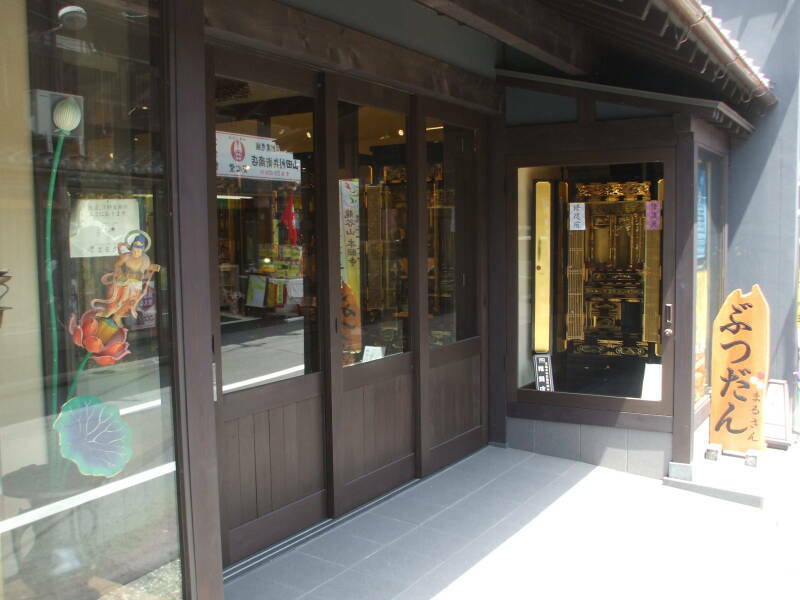 There are small shops selling charms and amulets and prayer beads at most temples, and the main street through Kōya-san has several shops with sutras and other Buddhist writings, pictures, statues, and so on. 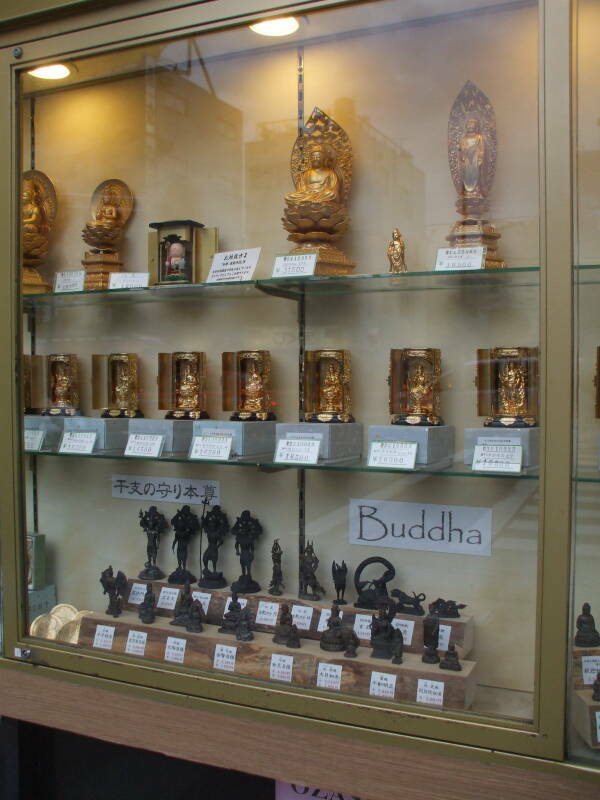 But if you want to set up a Butsudan or Buddhist altar in your home, or if you are equipping a temple, you would go to a specialist store. 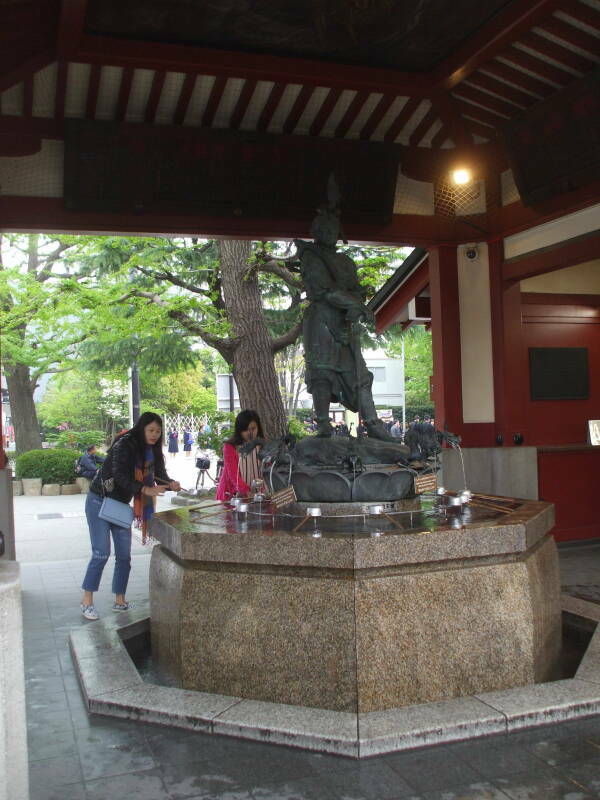 This one is in Kyōto, between the large temple complexes of Nishi Hongwan-ji and Higashi Hongan-ji. 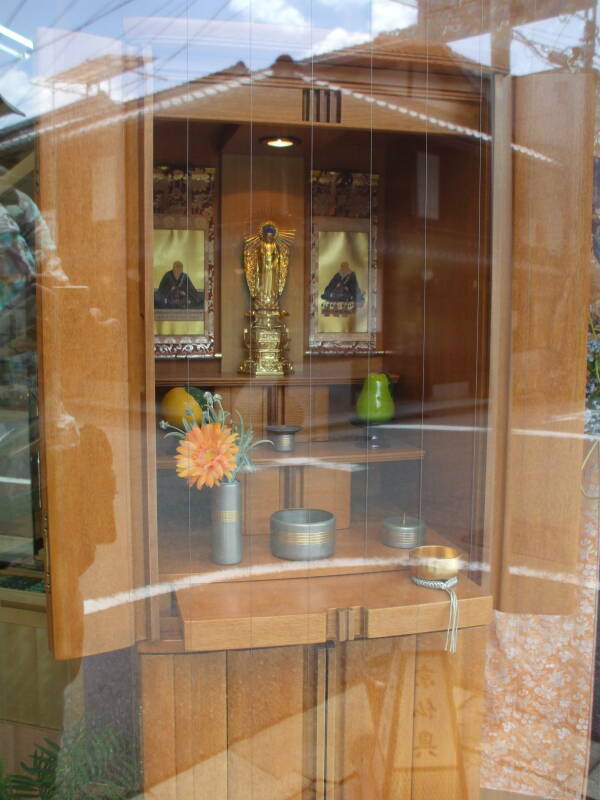 The first altar cabinet here is priced at ¥1,190,000 or about US$ 10,800. This would be for a temple. 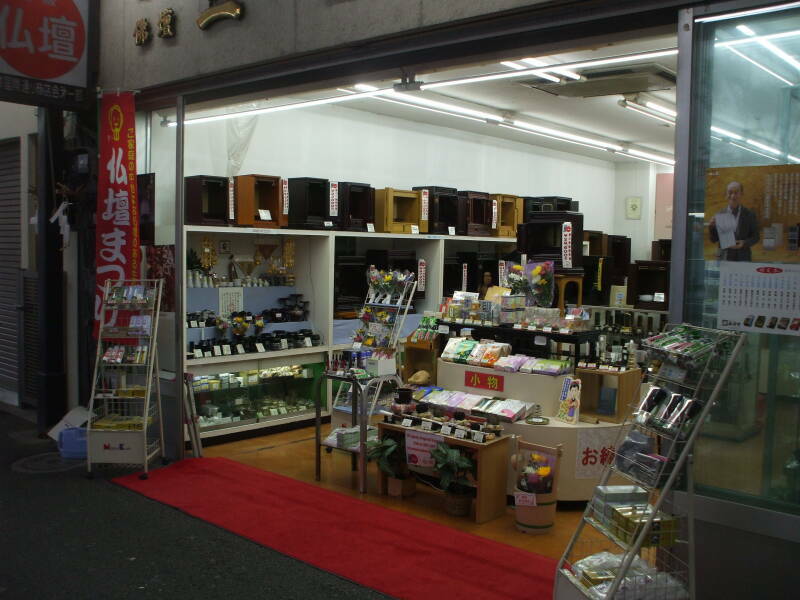 This store is near the Sensō-ji temple complex in the Asakusa district of Tōkyō. 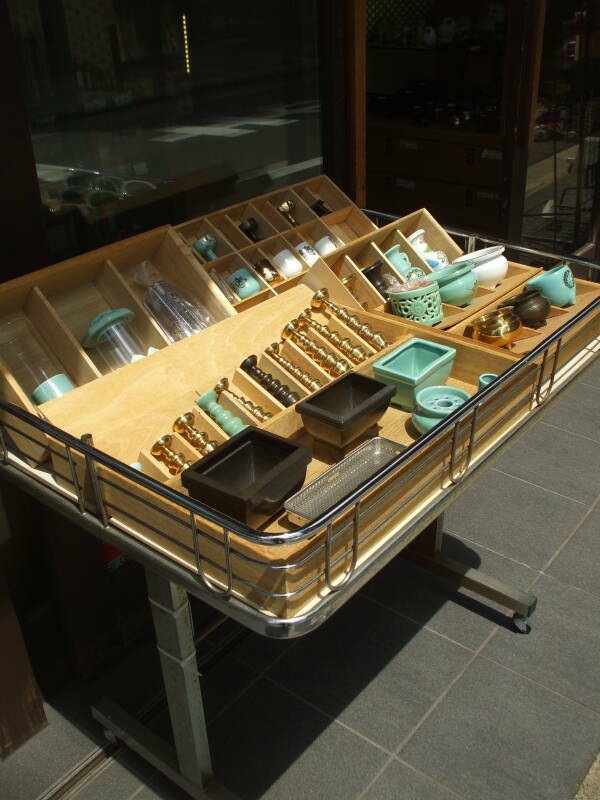 Those are small Butsudan across the top shelf, something far more practical for a typical home. 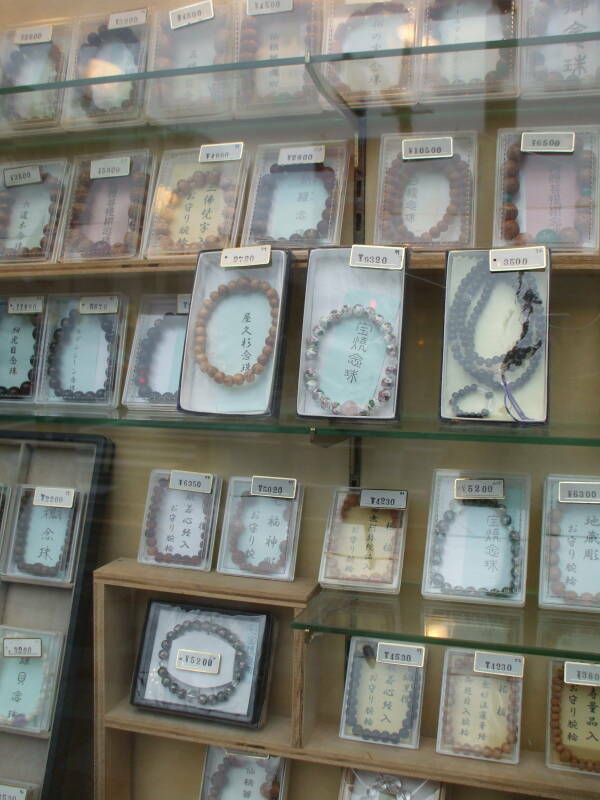 Christianity is very uncommon in Japan. Less than 1% of the population reports being Christian, and over one-sixth of them live in one city, Nagasaki. That's because that city was the only place that Europeans were allowed to live from the early 1600s until 1858. The Jesuit missionary Francis Xavier arrived in Japan in 1549. Christianity spread from Nagasaki through the island of Kyūshū, until the Shōgunate decided that Christian merchants were dominating trade and starting to interfere with internal affairs. Persecution began in 1587, and over 3,000 converts were martyred between 1597 and 1660. Christianity was officially illegal from 1637 until 1858. When foreign missionaries returned to Nagasaki in the 1860s, they were amazed to find about 20,000 "hidden Christians", part of a secret tradition that had survived almost 230 years.